Firefighters honored 19 colleagues at a memorial service Tuesday that included a standing ovation — both inside and outside the building — for the lone surviving member of the Granite Mountain Hot Shots crew, 19 members of which were killed in a desperate fire fight on a central Arizona mountain. Thousands of mourners attended the memorial service for the firefighters who died June 30 when they were over-run by a wind-whipped wildfire northwest of Phoenix. The service included a prayer read by the lone surviving member of the Granite Mountain Hot Shots. "I miss my brothers," said 21-year-old firefighter Brendan McDonough, who received a standing ovation from those inside the building and in an outdoor overflow seating area. "Thank you for supporting me." Organizers set up a large monitor outside Tim's Toyota Center in Prescott to accommodate the overflow crowd. About 30,000 people had been expected to attend the service. "I saw joy in the hearts of each one of them when they were doing their jobs," said Prescott Division Fire Chief Darrell Willis. "I take comfort in the fact I would have followed them blindfolded. They brought everything to the table"
Willis and other members of the firefighting community spoke in front of a large U.S. flag. Poster-sized images of the 19 firefighters were lined in front of the speaker's podium. Brendan Mcdonough, lone survivor of the Granite Mountain Hot Shots, recites the Hots Shots prayer at a memorial service Tuesday July 9, 2013 for his colleagues. In front of the pictures, the crew members' uniforms, boots, hand tools and helmets were placed in a row. "What happened on Yarnell Hill is still raw," said Prescott Fire Chief Dan Fraijo. "Even so, I can assure you our people will keep their heads up high. If I could fulfill my fondest wish, it would be that my tears wash away the pain that we all feel. "I was proud to be their chief." An honor guard pesented the victims' families with U.S. and Arizona flags. The families also were presented with bronze firefighting hand tools, a nod to the Pulaski tool commonly used by wildland fire crews to construct firebreaks. The firefighters, members of the Granite Mountain Hotshots crew, were killed June 30 as they fought a 13-square mile wildfire near the community of Yarnell, Ariz. The wind-whipped fire marked the deadliest wildland fire since 25 firefighters were killed as they fought the 1933 Griffith Park fire. Dan Bates, vice president of the local firefighters association, said the men were protecting a community they loved. 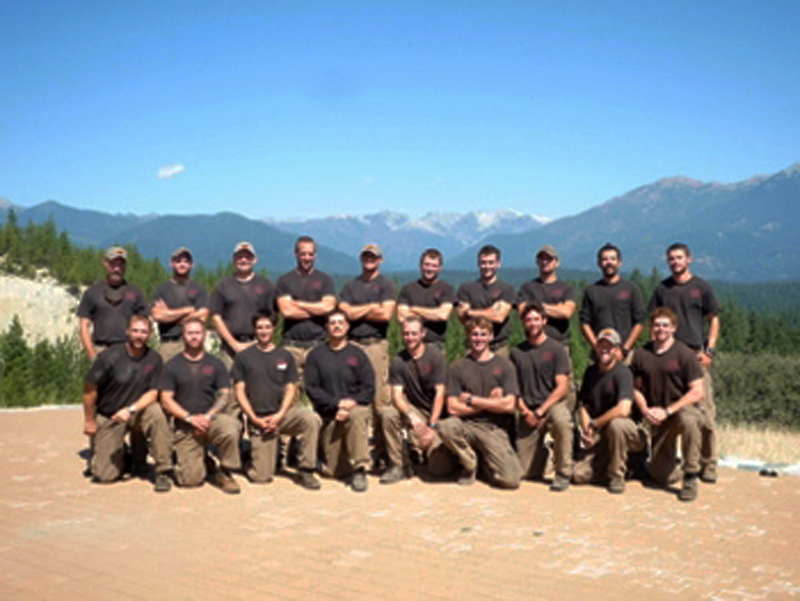 The men not only fought fires, but cleared defensible space to protect homes, developed community disaster plans and trained other firefighters. "Protect us they did, not just June 30, but for many years and in many ways," Bates said. "Anything Prescott need, anything Arizona needed, these Hot Shots stepped up." Bates and members of the Prescott Fire Department were joined by several Southern California firefighters at the memorial. Members of the Los Angeles county and city fire departments boarded buses early Tuesday to join colleagues from throughout the United States and Canada at the service. During a bagpipe and drums procession Monday at the town center, some firefighters wore shirts with the victims' names listed on the back and the words, "We will never forget." "More than half of our guys from LA City are former hotshots, wildland firefighters -- so it hit close to home for all of us," said Greg Holly, of the Los Angles Fire Department. "The other guys that don't come from a wildland background still feel that bond." Vice President Joe Biden and Arizona Gov. Jan Brewer spoke at the service. 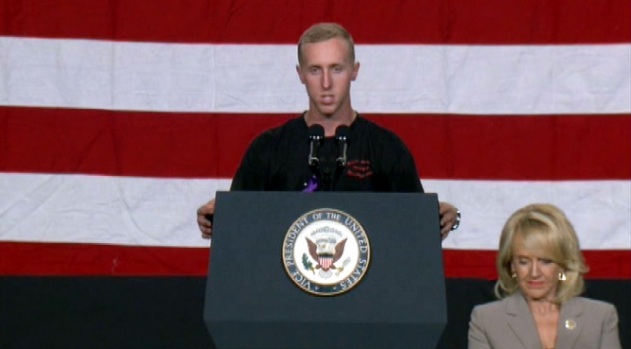 "To the Yarnell 19, we will never forget your sacrifice and that of your families," said Brewer, who thanked President Barack Obama for his "kind words" and assistance. Residents of Prescott Valley and other visitors have left flowers, notes and other items along a fence near the Prescott Fire Department since the deadly June 30 fire fight. Firefighters brought shirts from fire departments represented at the memorial to add to the memorial. Nineteen hearses, each accompanied by an honor guard, transported the firefighters' bodies Sunday from the medical examiner's office in Phoenix to Prescott as people -- many from the community the firefighters died trying to protect -- lined streets and waved American flags. The victims were identified as Anthony Rose, 23; Eric Marsh, 43; Robert Caldwell, 23; Clayton Whitted , 28; Scott Norris, 28; Dustin Deford, 24; Sean Misner, 26; Garret Zuppiger, 27; Travis Carter, 31; Grant McKee, 21; Travis Turbyfill, 27; Jesse Steed, 36; Wade Parker, 22; Joe Thurston, 32; William Warneke, 25; and John Percin, 24; Kevin Woyjeck, 21; Chris MacKenzie, 30; and Andrew Ashcraft, 29. "Firefighting was not what they did, it was who they were," Biden said. "There's a long history of ordinary Americans doing extraordinary things." Most of the victims were in their 20s. "Aside from 9/11 this is the largest firefighter tragedy in the history of the fire service," said Capt. Tom Richards, of the Los Angeles County Fire Department. 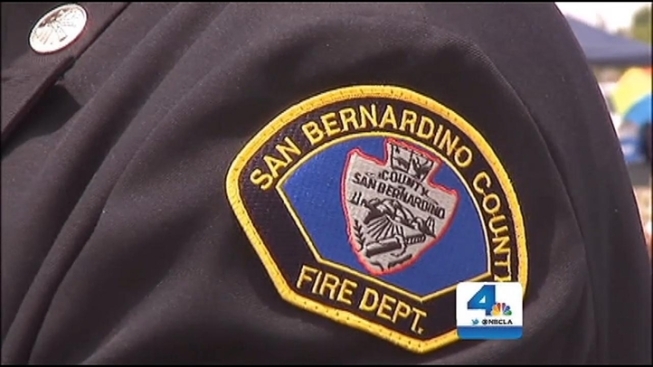 "To honor these firefighters is something the guys and ladies needed to do." The service closed with the reading of the victims' names, each followed by the ringing of a bell. McDonough then read the Hot Shots -- the name comes from Granite Mountain, located in central Arizona's Yavapai County -- prayer, which ends with the words, "For if this day on the line, I should answer death's call, Lord, bless my hot shot Crew. My family, one and all." McDonough was serving as a lookout when the lightning-sparked fire overtook his colleagues, several with Southern California connections. Woyjeck is the son of Los Angeles County Fire Capt. Joe Woyjeck. He started out as a Fire Explorer, a training mentorship program, and worked as an emergency medical technician. He called his father before heading out with his crewmembers to battle the Yarnell Hills fire. 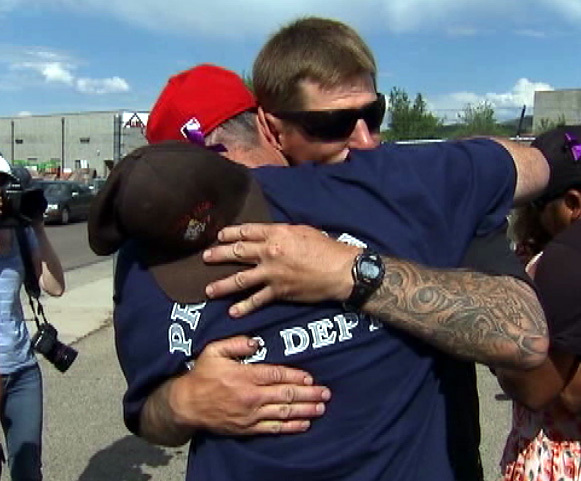 On Monday, Joe Woyjeck and his wife embraced fellow firefighters, including members of the Prescott Fire Department. The firefighters wore purple ribbons in memory of the Woyjecks' son and his 18 colleagues. "This is going to be a brutal day, but it's something that's necessary," said Woyjeck, wearing his son's Angels baseball hat, before the service. MacKenzie graduated Hemet High School in 2001 and joined the U.S. Forest Service. Warneke, also a Hemet High School grad, is survived by his wife, his high school sweetheart who is expecting their first child in December, his grandparents said. McKee grew up in Costa Mesa. Misner, from Santa Barbara County, also is survived by his wife, who is pregnant.